Laura Elizabeth Ingalls Wilder (February 7, 1867 - February 10, 1957) gained renown for her Little House series of books detailing her childhood years spent as a pioneer in the Great Plains. Laura was born to Charles and Caroline Ingalls near the small town of Pepin, Wisconsin, as the second of five children. Over the course of her childhood, the Ingalls family made their home in Wisconsin, Kansas, Minnesota, Iowa, and the Dakota Territory. Laura's early life experiences in the homestead near Independence, Kansas, provide the basis for Little House on the Prairie. 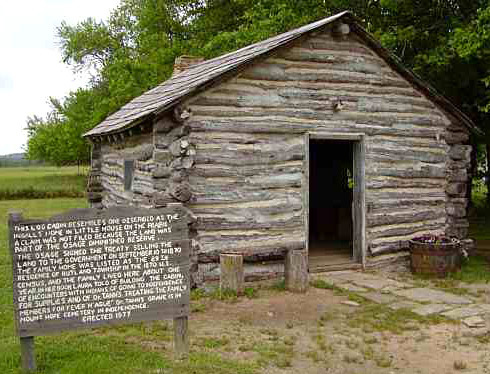 This cabin is a reproduction of the Ingalls cabin, a travel stop near Independence, Kansas. Although not graduating from high school herself, Laura Ingalls taught three terms of classes in a one-room schoolhouses in South Dakota. Laura married Almanzo Wilder, age 28, on August 25, 1885, at the age of 18. After years of hardship in South Dakota and brief stays in Florida and Minnesota, the Wilders settled in Mansfield, Missouri. Before the success of the Little House series, Laura served as a columnist and editor for the Missouri Ruralist between 1911 until the mid-1920s. Little House in the Big Woods was published in 1931 with the help of Laura's daughter, Rose Wilder Lane (born December, 5 1886). Rose helped with all future Little House books, though the level of her contribution, whether minor or dominating, is not clear. 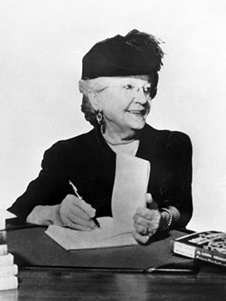 Laura Elizabeth Ingalls Wilder died on February 10, 1957. She is buried next to Almanzo and Rose in Mansfield, Missouri. The Little House series is made up of eight books originally published between 1932 and 1943. The First Four Years (1971), published postumously, is considered a separate work. Other works consisting of Wilder's letters and diary entries, have also been published in the years following her death. Once upon a time, sixty years ago, a little girl lived in the Big Woods of Wisconsin, in a little gray house made of logs. The great, dark trees of the Big Woods stood around the house, and beyond them were other trees and beyond them were more trees. As far as a man could go to the north in a day, or a week, or a whole month, there was nothing but woods. 'Even when it's settled up?' Ma asked. Laura knew what he meant. She liked this place, too. She liked the enormous sky and the winds, and the land that you couldn't see to the end of. Everything was so free and big and splendid. Sunday afternoon was clear, and the snow-covered prairie sparkled in the sunshine. A little wind blew gently from the south, but it was so cold that the sled runners squeaked as they slid on the hard-packed snow. The horses' hoofs made a dull sound, clop, clop, clop. Pa did not say anything. Sitting beside him on the board laid across the bobsled, Laura did not say anything, either. There was nothing to say. She was on her way to teach school. Only yesterday she was a schoolgirl; now she was a schoolteacher. Mrs. A. was angry. Her eyes snapped, her voice was shrill and a red flag of rage was flying upon each cheek. She expected opposition, and anger at the things she said, but her remarks were answered in a soft voice; her angry eyes were met by smiling ones and her attack was smothered in the softness of courtesy, consideration and compromise. I feel sure Mrs. A had intended to create a disturbance but she might as well have tried to break a feather pillow by beating as to have any effect with her angry voice and manner on the perfect kindness and good manners which met her. She only made herself ridiculous and in self defense was obliged to change her attitude. Since then I have been wondering if it always is so, if shafts of malice aimed in anger forever fall harmless against the armor of a smile, kind words and gentle manners. I believe they do. And I have gained a fuller understanding of the words, “A soft answer turneth away wrath.” Until this incident I had found no more in the words than the idea that a soft answer might cool the wrath of an aggressor, but I saw wrath turned away as an arrow deflected from its mark and came to understand that a soft answer and a courteous manner are an actual protection. Nothing is ever gained by allowing anger to have sway. While under its influence we lose the ability to think clearly and the forceful power that is in calmness. Anger is a destructive force; its purpose is to hurt and destroy, and being a blind passion its does its evil work, not only upon whatever arouses it, but also upon the person who harbors it. Even physically it injures him, impeding the action of the heart and circulation, affecting the respiration and creating an actual poison in the blood. Persons with weak hearts have been known to drop dead from it and always there is a feeling of illness after indulging in a fit of temper. Anger is a destroying force. What all the world needs is its opposite, an uplifting power. Mrs. A. J. Wilder (Laura), "As a Farm Woman Thinks," Missouri Ruralist,November 1, 1921. 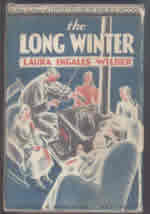 The popularity of Laura Ingalls Wilder's book series resulted in a loosely based adaptation for television. The Little House on the Prairie series ran from September 11, 1974, until May 10, 1982, resulting in an impressive 203 episodes. The series still recieves syndication today and remains a favorite of those who cherish the childhood stories of Laura Ingalls Wilder.